Kicking off the 2016 Holiday Season.... La Foret's Annual Halloween Festival! 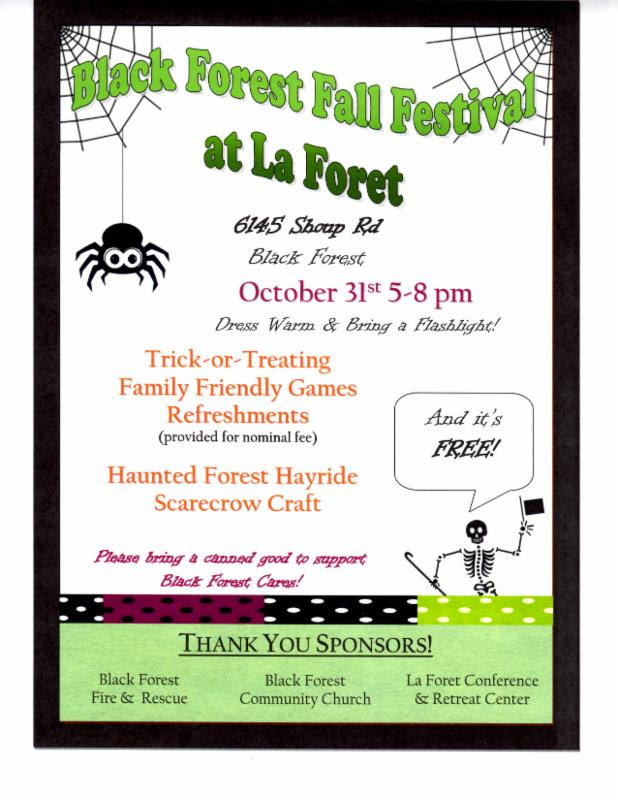 La Foret is hosting a local favorite, Black Forest Fall Festival on Monday, October 31, from 5:00 - 8:00 PM. As in the past, this is a very fun and safe event, open to all children and adults free of charge. 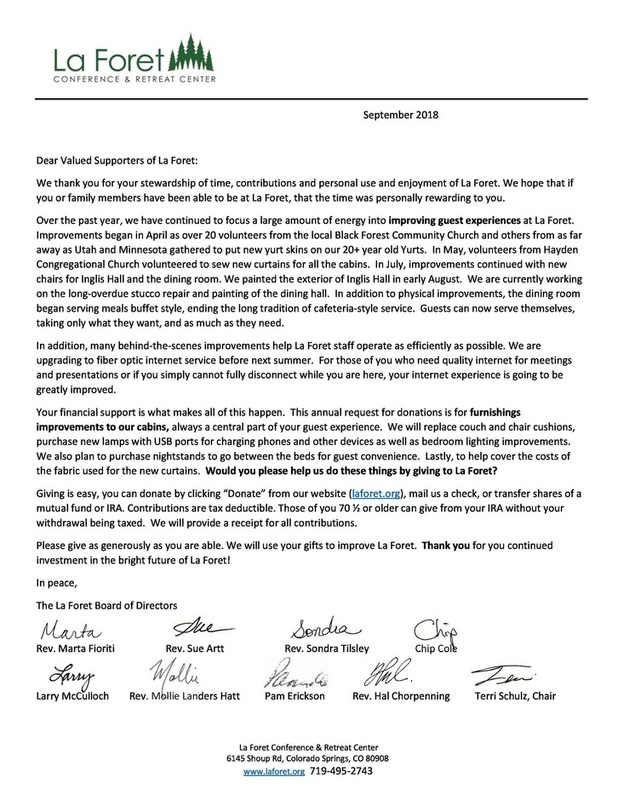 This year's exciting activities will include trick-or-treating from cabin to cabin, and each cabin is set up in Halloween decoration sponsored by local small business owners. The event will have family-friendly carnival games at the dining hall, which includes the world famous cake walk! Our La Foret kitchen will have a delectable menu of kid-friendly food items such as hot dogs and French fries (for a minimal fee). We will also have our much-anticipated haunted forest hayride! This year, we'll also have a fun scarecrow craft complete with a real live scarecrow to talk to and have pictures taken with. What a cool evening, packed full of community-togetherness and festive excitement. Last year such fun at our Halloween Festival, and we have some great feedback to improve this year! Our hayride zig-zagged through the dark woods, with surprises around each turn! We will be taking a slightly new approach this year, shortening the route to accommodate all of our guests. So now in a timely manner, guests will still have lots of creepy hauntings throughout the woods, on this hair-raising wagon ride. We don't want to keep guests waiting in a long line during too-long wagon rides. We've applied the feedback from last year to make our event bigger and better! As always, you may bring canned food items that we so proudly pass along in donation to the Black Forest Cares project. Thanks to our partner sponsors in this community-fun event! Join us Halloween day, 5:00 PM-8:00 PM for this wonderful Halloween Festival! Halloween has come to mean many things to many people. Roman Catholics and many mainline Protestants, for example, continue to observe All Saints’ Day for its spiritual significance. In the Catholic Church it is considered a holy day of obligation, when people are required to go to Mass. All Souls’ Day is celebrated soon after. In fact, the entire month of November is set aside as a time to pray for the dead.